Workers and contractors for Sunoco Pipeline begin an 'additional investigation' of geological conditions behind homes at Lisa Drive, West Whiteland Township, Chester County where the company has been drilling for construction of the Mariner East 2 and 2X pipelines. 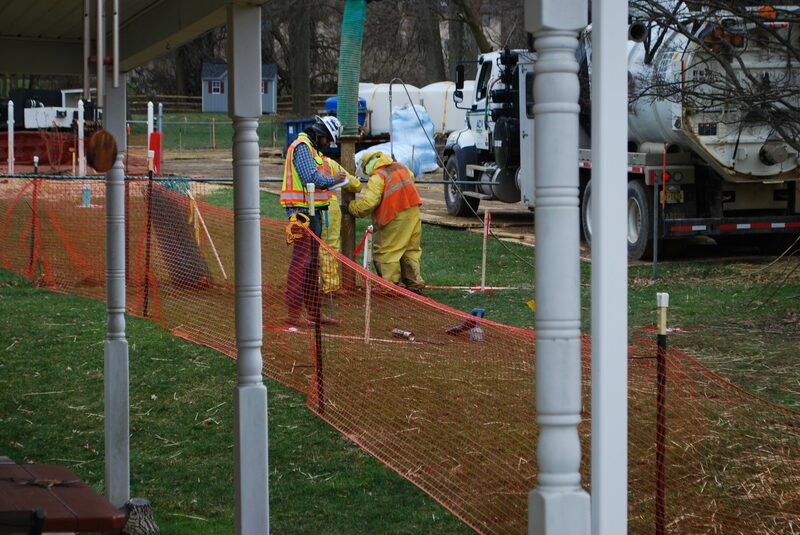 Workers and contractors for Sunoco Pipeline have been investigating geological conditions behind homes at Lisa Drive, West Whiteland Township, Chester County after sinkholes developed during drilling for construction of the Mariner East 2 and 2X pipelines. Regulators shut down the nearby Mariner East 1 pipeline because of potential danger related to the sinkholes, and ordered Sunoco to perform new testing to ensure that pipeline’s safety before the company can resume its operation. More than a month after the Mariner East 1 pipeline was shut down over safety concerns, representatives for Sunoco say they’ve found no problems, and that they’re looking forward to getting the natural gas liquids pipeline running again. But state officials say they’re not making any decisions to put the Mariner East 1 back in service yet. Problems with the pipeline began late last year when a rash of sinkholes opened nearby. In early March, the state Public Utility Commission ordered that it be shut down. The concern, they said, is that the unstable ground, plus nearby construction on the Mariner East 2 pipeline, could be a threat to public safety. PUC Chairman Gladys Brown ordered Sunoco to inspect Mariner East 1 in the area of where the sinkholes formed, then shut down the line while it studied geological conditions. It would then submit its findings for approval by PUC inspectors. Now, Sunoco is saying it has finished testing the area, and has found there is no safety issue. But PUC spokesman Nils Hagen-Frederiksen said investigations are going to continue, regardless of Sunoco’s findings, because the commission’s Bureau of Investigation and Enforcement hasn’t reached a verdict. “The commission has made it very clear that service will not be reinstated until the concerns raised by I&E have been addressed,” he said. There is no timeline for restarting Mariner East 1 operations.